Former EPA Administrator Scott Pruitt still has some issues nagging him back in Washington where he left amidst some ethics scandals. 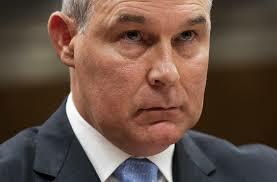 Federal ethics officials are balking at a $50-a-night Washington condo deal by Pruitt, the former Oklahoma Attorney General. The Associated Press reported the Office of Government Ethics said in a finding posted recently that it would not approve one of Pruitt’s last financial disclosure reports after his resignation amid ethics scandals last July.